A while ago now I met Dr Nick Lowe and walked away with a few goodies to try. 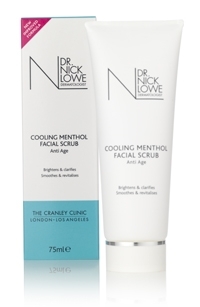 The Cooling Menthol Facial Scrub is one product that I was keen to give a go, being a fan of facial exfoliators and loving a bit of minty freshness too. This is what they say: “Reveal a softer, brighter and more radiant complexion with this menthol-based creamy facial scrub using gentle spherical micro beads to smooth the skin, purify pores and help stimulate cell renewal. From the first application skin is left thoroughly cleansed, smoother and brighter. Use every week for optimum benefit.” So no revolutionary claims, but knowing that Dr Nick only puts good ingredients in his range I knew that this was bound to deliver. I used the scrub in the shower and squirted a pea-sized amount into my hands, massaging around my face in circular motions. The grains in this scrub are larger than in most, meaning that they really do help to remove that dull top layer of skin and make you feel a bit more radiant. The menthol sensation isn’t so strong you feel like you’re washing your face with toothpaste, but it does leave your skin fresh and your brain awake. You don’t need much of this to go a long way because the grains are larger – normally they get washed away so quickly, but these hang around for a bit longer. Because of the strong results you really shouldn’t use this product more than once a week or it will have an adverse effect on your skin… after using this once I had a little pimple breakout which just made me think it was working and getting the gunk out of my skin. At £10.99 I think it’s reasonably priced if you suffer from bad skin or just want a good product; it’s going to do much better than that £4 scrub you’ve got lingering in your bathroom! Ooh goody a new face scrub for me to try!